How many of you are old enough to remember Remington Steele? The Remington Steele Detective Agency was actually owned by a woman, but, because the TV show started in 1982, she needed a man's name, and a man as a frontman. She ended up working with a man who pretended to be Remington Steele. E.J. Copperman's new mystery,Written Off, reminds me of the premise of Remington Steele. It's the first in the new Mysterious Detective series, featuring a mysterious man. Rachel Goldman is an author who has just completed the fifth in her Duffy Madison mystery series. Madison is a consultant to a New Jersey county prosecutor's office. But, she doesn't find it very funny when she gets a phone call from a man claiming to be Duffy Madison, saying he needs her help. And, she knows he's a nutcase when he shows up at her book signing, identifies himself as Duffy Madison, and says he believes she made him up. He has no memory going any further back than four years, at the time she started her series. He is a consultant (to a different county), and he needs her help to find a missing woman. It seems a mystery author is missing, and she's not the first female mystery writer to disappear. But, the others ended up dead. Duffy (whoever he is) believes Rachel holds the key to finding the missing woman before she too ends up murdered. And, when Rachel receives a threatening message, she worries she's next. But, can she really trust a man who may or may not be Duffy Madison? And, where did he really come from? Worst of all, what mystery writer wants to hear that her character, or a man claiming to be him, never heard of her books? If Duffy Madison comes across as a little stiff and pedantic, it's because Rachel Goldman wrote him that way. 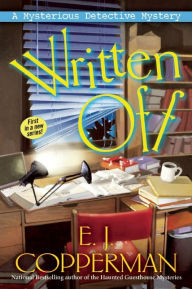 Written Off is a fun mystery precisely because Rachel doesn't know what's actually happening. Because she doesn't know who to trust, she uses her own skills as a mystery writer, and the research skills of her assistant, to dig for answers. No one who has read Copperman's earlier books will be surprised at the humor or the interesting characters. Rachel's relationship with her father is delightful. And, let's just say the relationship with Duffy Madison is developing. Looking for a new mystery series, light, humorous, and intriguing? Check out E.J. Copperman's Written Off. You'll want to know more about Duffy Madison. Written Off by E.J. Copperman. Crooked Lane. 2016. ISBN 9781629535999 (hardcover), 336p. FTC Full Disclosure - The publisher sent me a copy of the book, hoping I would review it. I almost always try out your positive recommendations. We do not always love the same things but I have gotten started on many wonderful series from you. I especially love it when you recommend a book that is late in the series and then I can binge read from the beginning. Anyway I have put this on hold and am looking at his Asperger's mysteries to also try. I have a hold on this one in the library. Diane, I highly recommend the Asperger series, and I think I need to look into the author's other series because his writing is so good. I love her books. Thanks for a chance to win a copy. Diane, I'd be surprised if we always loved the same things. I'm not even always in the mood for an author or series I've loved before. This one is a little different because you have to doubt both characters. Good luck! Sandy & Margie, I hope you like it!